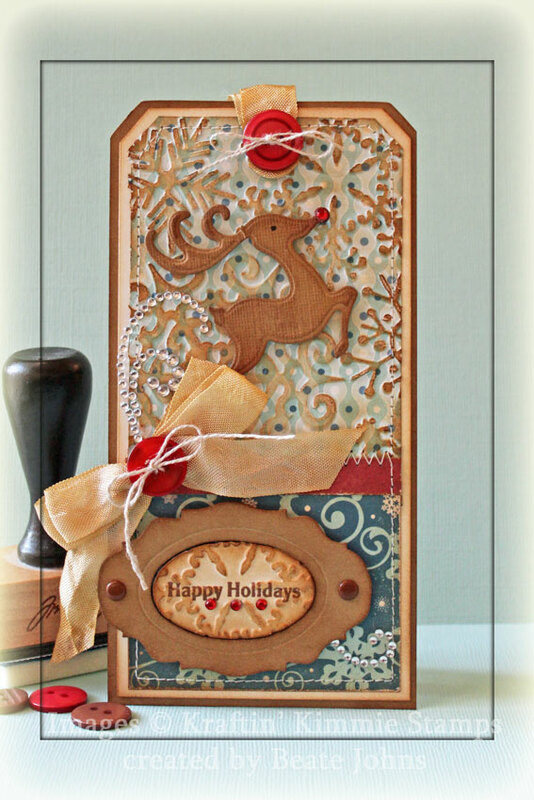 I am excited to be a guest designer for Kraftin’ Kimmie Stamps this month! My gig starts out easy with today’s Kraftin’ Kimmie challenge . Use heat or dry embossing on your project. Since making my first tag for the Flourishes Timeless Tuesday challenge this week, I was itching to create another tag. For this one I started out with embossing a 2 /3″ x 4″ piece of Winter Park Patterned paper with a Snowflake Embossing Folder. The raised snowflakes were sanded and the sponged with Vintage Photo Distress ink. Two more 2 3/4″ wide pieces of the same paper pack were sanded and stitched to a 3″ x 6″ piece of Neenah Solar White cardstock that had been sponged with Vintage Photo ink. The layers were adhered to a piece of Kraft cardstock that had been cut with Tim’s large tag die. For the sentiment panel I cut a piece of white and Kraft Cardstock with Tim’s Tag die. From the white piece I used the inner oval of the sentiment label. A sentiment from Kraftin’ Kimmie’s Holiday Sentiments was stamped in Rich Cocoa Memento Ink in it’s center. Then it was embossed with the same embossing folder used for the Winter park paper and sponged with Vintage Photo Distress ink. From the Kraft cardstock I used the outer part of the label. It was also sponged with Vintage ink and two brown brads were added. The panel was adhered with dimensionals to the lower part of the card. I dyed some seam binding with Vintage Photo Distress Re-inker and water. It was turned into a bow and a button was tied on with Linen Thread. Parts of a Finesse Swirl were added above the bow and underneath the sentiment label. Three red Baby Bling Rhinestones were added under the sentiment. 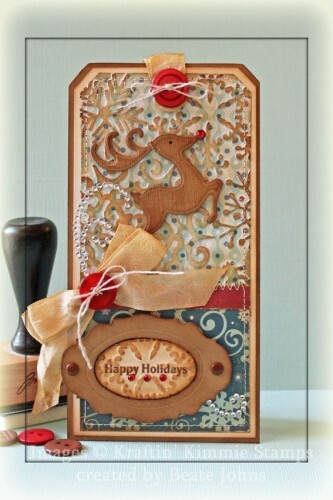 As focal point for the upper part of the tag, I cut and embossed a piece of textured Kraft cardstock (Stampin’ Up!) with a Fanciful Holiday Shapeabilities die. It was sponged with Vintage Photo ink and a red Baby Bling Rhinestone was added to it’s nose. More dyed seam binding was attached to another red button and adhered to the top of the tag. Thanks so much for stopping by! I hope you have time to participate in the challenge. I love seeing ideas for that deer – he’s so sweet. And what a gorgeous colour palette with the red accents. this is gorgeous, Beate! love all the textures! This is so beautiful !! The embossed and inked layers are fantabulous!!!!!!! 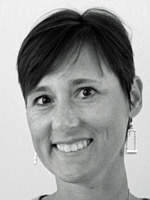 Congratulations Beate! I am excited to see all you create this month! Your tag is wonderful! Love the sponging you did on the embossed snowflakes! Beautiful! OMG was für ein megageniales und traumhaft schönes Tag.